The Oscars are behind us and movie fans will have to wait for another year to see which titles will be nominated for the next Academy Awards festivity. This doesn’t mean that this period will be marked by a long drought, in fact those who also love slot games can enjoy the best of both worlds. All major software developers have released or announced movie themed slots and some of them are based on the latest Hollywood blockbusters. Microgaming has launched Star Appeal, a slot game that without being inspired by a particular title, closely revolves around the movies industry. A total jackpot worth 5000 coins is up for grabs and the symbols gracing the reels are all consistent with the glamor that Hollywood is famous for. Symbols range from agents and photographers to trophies and pet dogs, while the starlet is the wild one and and will replace any other signs on the reels. The central feature of this game goes by the name of Star Feature and it requires three or more star symbols appearing on the reels. When this happens, players receive 10 free spins or more and the payouts are all doubled while these bonus spins are in effect. 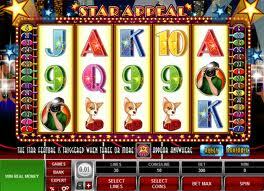 Since Star Appeal is a Microgaming title, it comes as no surprise that players with an inclination for gambling will find the gamble game exciting. Those who don’t mind risking all their profits can attempt double them up by activating this feature. http://www.casinoadvisor.com/movie-themed-slots-online-article.html goes to details in presenting the movies themed slot game and also gives players the heads up about titles launched by other software developers. Playtech came up with its very own slot game named Cinerama which invite players to take a short voyage into the past and see how movies used to be made. Instead of glittering modern symbols, the reels are scattered with film scripts, headphones, film reels and directors megaphones. The wild symbol is represented by the camera and this is the one award in the progressive jackpot worth a total of $40000. There are also 2 bonus games in store, with one inviting players to take a fictional voyage to the cinema and choose the film that will play there. The second mini game is even more exciting as players assume the role of directors and decide which actors and actresses will feauture. The final stage depicts the awards festivity and players are compensated more or less depending on the movie’s success. Cryptologic might have been late to the party, but the software developer compensates by releasing a bungalow for slot games called Movie Mayhem. The silent era is represented by Silent Screen, Sunday Afternoon Classics depict the classics, the Fantasy Realm presents the fantasy world while the science fiction genre is depicted by the Outta Space Adventure. Although the four games are different and it provides players with a much-needed variety, they are all connected with the same progressive jackpot. This means that a single bonus game is going to present the players with the chance to win a huge amount, and it makes no difference what titles they prefer. There are four types of jackpots and their size depends on how many tickets players collect, with four of them triggering the release of a top prize. Each and every slot game of the Movie Mayhem bundle awards free spins and the number depends on how many scatter symbols players discover on the reels. If you are a slot game enthusiast and want to start spring on a positive note, than make sure that you don’t miss out on the once-in-a-lifetime opportunity provided by Euro Palace casino. 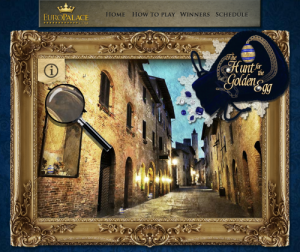 Palace of Prizes is not your regular promotion, and the online casinos made sure that players will find out about it in time to reap all the benefits. For starters, the campaign doesn’t last for a single week or two, but covers two months with the deadline being April 22. Existing Euro Palace players are probably competing in a multitude of contests and have already scooped some of the prizes, as the promotion kicked off on February 26. Those who are contemplating their participation, should know that all those who create an account with the online casino will receive the qualifying instructions in their e-mail. Those who meet the wagering requirements and are deemed eligible to enter the Palace Of Prizes will have nothing more to do with them to choose one of the numerous objects displayed. There are no bad choices because regardless of what they decide, there are numerous prizes hiding behind each object. Given the fact that the promotion runs for two straight months, it pays off to stay up to date with the weekly schedule and visit the promotion page online. By March 3 the casino already offered 1 million VIP points, and the current week is focused on showering participants with as many as 2000 free spins. The ongoing stage is code-named Bedchamber and will conclude on March 10, when players will be invited to raid the Study the rule and compete for a grand total of 2000 credits. Things are about to turn serious on March 19 when the dungeon opens its gates and players will once again compete for 1 million VIP points. If you are reluctant to deposit money this weekend but you don’t want to miss out on the opportunity of raiding the library, rest assured that another chance will come at the end of the month. The only difference is that the second raid will award free spins, while April invites players to revisit all of the rooms that they have already explored in March. Euro Palace saves the best for last and players have no excuse for missing out the final week promotion which takes place in the throne room. The lucky winners will receive a prize of €2000 and the prestigious Diamond Club VIP status for life, which means that they will enjoy exclusive bonuses and promotions for as long as they play at this online casino. With Euro Palace being powered by Microgaming software, it is only fair to say that players will not get bored even if they play slot games every day throughout the lengthy promotion.